Raw Buckwheat Honey in a 5 pound container. Raw buckwheat honey in a 5 pound container. Raw honey has not been heated and simply filtered through a large mesh screen. The screen removes larger particles and allows pollen, propolis and beeswax particles to pass through it. Buckwheat honey is pungent in flavor with molasses and malty tones and a lingering aftertaste. Buckwheat honey is also very dark in color. As a general rule, darker honeys tend to be higher in antioxidant compounds than lighter ones. Because of this characteristic, darker honeys also tend to be higher in mineral content on average, as compared to lighter honeys. Raw, unfiltered Buckwheat honey is my favorite. This honey is the best I’ve had in years. It is very dark in color, is thick, full of flavor and tastes very fresh. This was my first time ordering from this company. The service is very good and delivery was prompt. I will continue to buy from them. 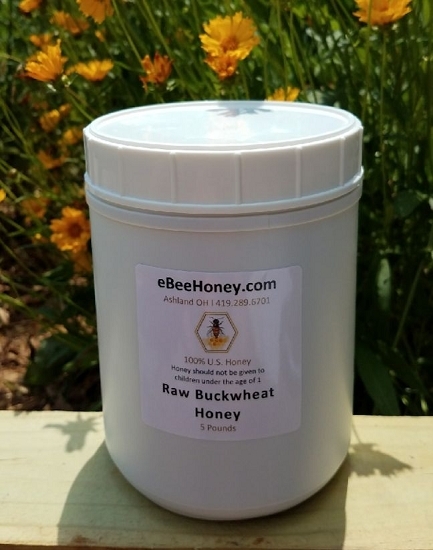 This Buckwheat Raw Honey is Wonderful! I chose buckwheat because I wanted the darker raw honey due to it's benefits. I take it As Is on a spoon daily because I enjoy it so much. My husband thinks it's great as well. I think the title says it all. I am definitely partial to buckwheat honey. I tried different companies, but eBee won. Exceptional quality and taste. Thank you. Arrived and packaged well but website says they are new York which is what I wanted was ny honey and this shipped from ohio.so totally defeated the purpose of what I wanted. Also I wish they would sell empty bottles for me to split the honey into smaller squeeze containers. However as far as taste I was pleasantly surprised it's good it does have a quick bitter taste if u eat it plain. I use it in coffee and hot cocoa to help with plehm. And its sooooo sweet. I have gerds so my morning plehm is bad. I have also used it to lightly coat my chicken before adding barbque and so far the family likes it. So not entirely disappointed that I didnt recieve nystate honey. Still a good product and while it wasnt what i wanted its not going to go to waste as it still has major health bennefits. Also one of my favorite to have with lemons when I have cold. Very yummy! Very good quality, fast shipping, and friendly service -- I highly recommend this company and their products. This is the best buckwheat honey I have ever had. I've placed several orders and will certainly order again in the future. Buckwheat is known for its many benefits. Flavor is wonderful! I didn't know that bees made Blackstrap Molasses. LOL!! Your Raw Buckwheat Honey is like I've died and gone to honey Heaven! God's perfect designs amaze me! Trust me; I'll be back for more! Very different from the raw clover honey I was familiar with. Looks like old motor oil. But the taste is amazing, earthy and sweet. Awesome in my coffee. 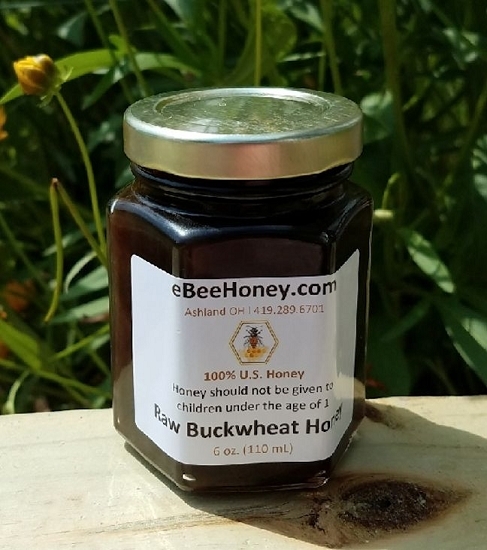 This buckwheat has a thick but smooth consistency.My wife and I love the flavor of this buckwheat honey It has a very clean taste to it. But all of ebeehoney taste like because of there high standers. I will always buy there honey! I have tried different types of raw honey but buckwheat is my favorite. Darker honeys are said to have more antioxidants than the clearer ones even though the clearer ones are still healthy if they're raw. This honey has a stronger taste to it. It reminds me of molasses. It however is delicious! On a side note...this is a very friendly, helpful company. I also ordered propolis for the first time. I was unsure of the way to take it. After contacting them, Glenn took the time to explain several things about propolis, royal jelly and other things to me. I truly appreciated that type of customer service. I plan to try some royal jelly next order. Thank you for amazing products and wonderful customer service! The flavor and appearance of this honey is marvelous. It is a rich deep amber brown and the flavor is robust. This buckwheat honey is very good. I'm very sutisfied with its quality and will recommend it to my friends. This is the best honey, wish I got the small mouth for the liquid honey, live both buckwheat and bamboo, i have had those before, first bought it about 7 or 8 years ago, but though honey was fattening now I know better I'll never do without it again. I have exclusively purchased all my honey from ebee for quite a few years. Customer Service is a priority, and the wide choice and selection is astounding. I am especially fond of the Buckwheat Honey, as this is the Creme de la Creme of Honey. It has a great taste, is very beneficial for the immune system, and tastes soooooo good. Another plus is in getting my honey in bilk, in wide mouth jars, which make it easy to transfer the honey into smaller glass containers. I usually make 3 orders a year, and enjoy the reasonable pricing and shipping charges for this wonder addition to my diet. Delicious, Nutritious and very good for my body as well. a perfect food and a perfect addition to hot cereals and in cooking. I give ebee the highest possible recommendation, and hold the people behind it in highest esteem for their dedication in harvesting this wonderful food for us honey lovers! Thanks Ebee. you get a High Hive From Me! I've ordered a number of honeys from eBee honey and there are no regrets on any of the various types of honey I've received. After ordering buckwheat in 2.5 lbs. it's time to up the ante to the 5 lb. size. 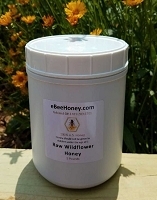 I have used eBeeHoney's buckwheat honey for my favorite recipes for years. I make my own energy bars and this honey is awesome. Love this raw buckwheat. Recommend it to anyone who has the taste buds for rich and rewarding. I love eBeeHoney's raw buckwheat honey! After a doctor suggested buckwheat honey a decade ago for bad coughs I did some research and discovered that it has some antibacterial and anti-inflammatory properties as well as being high in antioxidants. It's also know to work as a cough suppressant. And raw provides more benefits. It also tastes great. We use it in tea and for cooking in general. It has more depth of flavor, is more molasses like than other honeys. 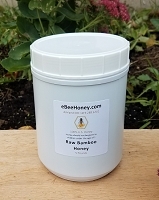 I highly recommend eBeeHoney's raw buckwheat honey! I LOVE MY Honey !!!! I eat a LOT of it !!! Now that I know of this place Il'l be a regular customer !! FAST QUICK EASY LOVE IT !!! This is great honey. Its awesome to have a place that doesn't heat their honey or use a lot strainers. The shipping was super fast and the packaging was great also. Will definitely buy from again. Lovely product and prompt shipping, will definitely recommend to my friends. We've been getting Buckwheat Honey for several years from eBeeHoney since we attended a lecture by University of Illinois entomologist May Berenbaum. Dr.Berenbaum asserted that buckwheat honey ranks at the top of honey when it comes to health benefits. We ordered from ebeeHoney.com's and its product and service is simply exemplary. I use this honey to make pasteli. It breaks tradition by not using a mild flavored honey. But this honey is very good tasting, as other reviewers have pointed out, it also has a high nutrient composition. Everyone comments how delicious the pasteli made with the buckwheat honey is. It makes an excellent all natural energy bar in the form of this pasteli. I'm so happy I'm able to buy this in the quantities and for the price. Thank you Ebee Honey ! We love this honey and the fact that it is from Ohio is wonderful. I brought the Buckwheat honey for gout and i received my honey on time. I was able to share it with friends in my church who also suffer with gout. this honey works great and it also tasted good! I ordered 2 each of the 5 lb bottles of Buckwheat, bamboo, and wildflower honey yesterday and I received all TODAY!!! My favorite is the Buckwheat honey, followed by the bamboo honey and wildflower honey. Customer service is amazing. 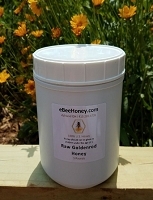 The honey is beyond delicious and I can say with certainty all my honey will be bought from www.ebeehoney.com. Thank you! I gave this honey as a gift. They loved it. It is very dark colored and very robust tasting. Almost like molasses, but much sweeter. Had to use up the buckwheat honey I already had before I could review yours. Your honey was much darker than what I had. It also had quite a different taste to it. Maybe because yours was raw and the other was more processed. It matters not as I prefer the flavor of yours as it was richer, fuller, heavier? Hard to describe but it was great! It's a great tasting honey. It looks and tastes exactly as I remember Buckwheat honey looked and tasted in Ukraine, the country I'm from: dark with real buckwheat honey taste. Delicious. Probably the best honey I've ever tasted in this country. I thought I bought buckwheat honey before at $22 for a large mason jar. Well, when I got eBee buckwheat, I thought I got the wrong thing. Then I mixed 3/4 clover honey to 1/4 eBee's buckwheat and realized that that was what they sold me disguised as buckwheat honey! Very pleased with the high quality 100% buckwheat honey I received! and at such a great price! This is my favorite honey, especially in tea and coffee. It has a musky taste, not as sweet as other honeys. That works especially well with coffee. It's also thicker than most honeys and Buckwheat is supposed to have the most anti-oxidants. Like having my cake and eating it too. As always, a sensation for the taste buds. I use it on everything. Our family physician recommended this honey for my allergies that cause chronic upper respiratory problems for me. It really helps. He even gave me a recipe. Bring 1 & 1/2 cups of water to a boil. Add sliced fresh ginger and your favorite tea. Let steep for 5 min. Reheat if necessary and remove ginger. Add 2 Tablespoons of raw buckwheat honey to the tea (yes, I know it's a lot). Add the juice of 1/2 lemon (or more if you prefer the taste less sweet). In a rush for time, I sometimes substitute the raw ginger for dried ginger and just sprinkle it in. If you are ill, our doctor recommends this tea 3 or 4 times a day. If not ill, once a day is enough. The taste of the honey is strong, so it took me a little while to get used to it. Now I love it and look forward to it every day. I love this honey; great flavor, not overly sweet, have been ordering for years. I love its dark rich flavor. Goes great with yogurt and egg nog shake. Purchased 5 lbs of buckwheat honey liquid. Received order in a couple of days. We use it mostly in herbal teas. I also use to sweeten a 5 grain breakfast cereal (cooked like oatmeal). It has not started to crystallize as of yet. Bought the wide mouth container just in case. Great product from the bees. Will buy again when this batch is used up. I don't eat it as often as the other honies, but that's because I bought a large selection, including comb honey. This honey is unique because of its anti-oxident characteristics. Taste is a little stronger than the rest, but its excellent; will be buying more, and more, and more. Fantastic taste - for those new to buckwheat honey be warned: This is not your normal honey. (If you are new, take a moment to read about it here on eBee Honey's site.) The taste is strong and flavorful - I especially like it drizzled on Greek yogurt with berries & nuts. It also goes well with Earl Grey tea. I especially liked the wide mouth jar - I've ordered before in the narrow mouth and the wide mouth is easier to use. Raw Buckweat Honey, 5 lb, wide mouth container. Good dark honey with real taste what I knew. Will order more. Eugene.